Goal: Teach your teen how to enter and drive roundabouts safely. Location: A road that leads to a one-lane roundabout. Move on to practice at two or more lane roundabouts when your teen is ready. Roundabouts are circular intersections designed to calm traffic, increase safety, reduce stop-and-go travel, and decrease traffic delays. Roundabouts have proven to be an efficient means to move traffic through congested intersections and have shown to reduce crashes by half (all but eliminating the more severe broadside and head-on collisions). 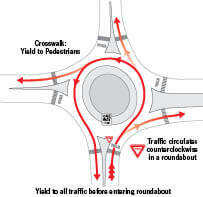 Roundabouts also offer a safe environment for pedestrians, who only have to navigate one-way traffic flow. Driving in a roundabout can be intimidating, but it’s really quite simple when you know how it works. This example shows the traffic movement patterns through a one-lane roundabout. The one-lane roundabout is known as one of the safest and most efficient intersections. Slow down: Speeds of 15 mph or less are adequate in the roundabout. Yield: Vehicles must yield to the left before entering a roundabout. Don’t stop: Never stop once inside the roundabout. The vehicle in the roundabout has the right of way. Follow signs: Look for destination signs and exit in that direction. Exit: Look to your right, check your mirror and use your turn signal. If you have not entered the roundabout, pull over and allow emergency vehicles to pass. If you have entered the roundabout, continue to your exit, then pull over and allow emergency vehicles to pass. As you approach, observe the signs and arrows to determine which lane to use before entering. If you want to make a left turn, stay in the left lane or other lanes that are signed and marked as a left turn. To make a right turn, stay in the right lane or other lanes that are signed and marked as a right turn lane. If you want to go straight, observe the signs and arrows to see what lane is correct. As a rule of thumb, when entering or driving a roundabout, always yield to traffic on your left.